In the last few days, I have visited to many Family Dollar stores. Some stores allow debit card load, and some don’t. I keep receipts of reload to remember which store allows debit card load for the future. A result was better than I expected. I have visited 15 stores and found 7 stores allow debit card load. 4 out of 7 are the store I found additionally with these visits, and the rest are the store I visited last year and confirmed they still allowed debit card load. I’ve used VGC by Meta bank and Bancorp so far. I haven’t used MCGC by US Bank that I couldn’t use at Walmart a few days ago. There are many other stores I haven’t visited yet. I will go and see if they allow debit card load. As for online debit card load, I decided not to call Amex. According to some forum posts, it seems it’s better not to call to draw their attention. Although I received an email from Amex regarding of a linked debit card, my Serve account doesn’t show any error message. It looks OK to load online. But to be cautious, I will wait for a few weeks. I gave up loading this month. The closest Walmart store from my home has a kiosk. A month ago, (when I decided to switch from Redbird to Serve) I visited to see if a kiosk was in a good shape. At that time, it was working well. To make sure, I actually swiped my reloadable prepaid cards (Mango and PayPay prepaid) and proceeded until it prompted me to swipe a card of payment. And then I canceled because I just wanted to make sure it was working, and for both cards, it charges $3.74 reload fee. Today, I visited there to load Serve with VGCs and MCGCs. My plan was to use five GCs. But, a kiosk was not working. The kiosk was surrounded by many shopping carts and put by a few plastic tapes. It wasn’t turned off, though. A display showed “Approval Needed”. Reportedly, it causes by loading a lot of money in the short period. (According to the forum, the limit is $1999 in 10 mins.) I have seen it frozen many times, but I have never seen it blocked by shopping carts and tapes. There was no choice. I had to give up using the kiosk and tried to load at cashiers. I used an MCGC issued by US Bank, and it didn’t go through. The system treated the card as credit. A display of PIN pad prompted to sign for a moment and then automatically canceled the whole transaction. I asked a cashier to do it again. I tried to hit the cancel button to change from credit to debit. But other clerk or manager came up from behind and saw me using a gift card. He told the cashier they couldn’t accept gift cards for reloads. I gave up loading today and left the store. After that, I headed to Family Dollar. The store is very close to Walmart. I have visited once and loaded with a Vanilla VGC. That was about a year ago. As the store I went yesterday, I was worried that they stop accepting debit cards for reloads. But they still allow it. I successfully loaded with $400VGC from Target. There are many FD stores in my neighborhood. I’m going to visit all stores and see which store accept debit cards for reloads. I remember that I was able to use MCGC by US bank at a kiosk. But I don’t remember how long ago. Maybe, the system updated to block these cards by now, or it happens only at a register. Or, if I hit cancel on PIN pad right after a swipe, does it give me a chance to choose between debit and credit? Today, I got a bad news from WM and good one from FD. Since a reload with Vanilla VGC via FD is still working, I went Target.com to buy more VGCs, but they were sold out. However, I found an incredibly great new item. Click here to see it yourself. A new rule was reported in many forums and blogs on May 5th, and it’s implemented on May 6th in all U.S. Target stores. It’s hard-corded. The POS system won’t allow credit cards as a payment for Redbird reloads. Before this new rule, several Target stores in my neighborhood already had their own rules. For examples, “Cash or Debit Only” “No Credit Cards” “No Prepaid Cards (gift cards)”, etc. However, there are many other Target stores in my neighborhood. So, I didn’t have much trouble reloading Redbird until yesterday. Loading with credit cards was the main benefit of Redbird for me (and I suppose, for the most cardholders, too.) I mostly used AmexGCs for reloads. It was really easy to reload $1000 without worrying about a decline by a bank. You didn’t have to deal with fraud alert as long as a GC has enough balance on it. Now, the benefit is gone, and this new rule is hard-corded and nation-wide. There is no way to get around it. Target accepts Cash or Debit for reload. Reportedly, the system allows PIN-enabled gift cards. But I think some stores don’t accept gift cards because of store-specific rules. And I don’t think split payment works anymore. When I asked split payment, transactions of each card were treated as credit. (see details here) So, from now on, you will need to make separate transactions with each gift card. The main benefit of Redbird is gone. I’m going to close Redbird and open Bluebird or Serve. I’m still thinking which one to open, but I’m sure I will close Redbird. The new rule makes Redbird inferior to Bluebird and Serve for the following reasons. You can’t use AmexGC anymore. For MS, the only option is to use PIN-enabled gift cards. I will use many $200 VGCs from BBY. 25 reloads ($200×25=$5000) every month are too many hassles. Besides, most local Target stores allow to reload at guest service only. Regular cashiers are not allowed, or simply they don’t know about Redbird. Each store has only one guest service. This means I have to go and ask the same clerk for multiple reloads. It’s not comfortable. Bluebird and Serve can be loaded by a kiosk at Walmart. You need to separate transactions with each gift cards, but it’s not a big deal because what you deal with is a machine. Even if a kiosk is out of order, regular cashiers know how to load. 5% instant discount sounds nice, but you can get more discount by purchasing TargetGCs from gift card resellers. It’s not difficult to find 5% or even 6% discounted GCs. If you buy those GCs with reward credit cards, an overall discount would be more than 5%. In case discounted TargetGCs are all sold out, keep in mind that Staples sells e-codes online. If you have Chase ink business credit card, you will earn 5x bonus reward on the purchase. So, 5% discount is not exclusive, and even more discount would be possible. Recently, Bluebird has been able to be connected Amex Offer via Twitter, Facebook, etc. And Serve has been also able to do it quite a while. Only Redbird can’t. Maybe in the future, but I don’t want to wait for something uncertain and miss good Amex Offers. I used to have Serve. I closed it for opening Redbird. From my experience, you can apply a new one right after closing the existing one. In order to close the account, you need to unload the card completely, by bill pays or withdrawing to linked bank account, which takes 3 to 5 business days. For this month, I have already done $1000 online reload, but in-store reload is only $1400 so far. I will load as much as possible in this week and unload completely next week. Then I will close Redbird and open Bluebird or Serve. There have been some minor changes to these cards since I got Redbird. So, I will need to review all benefits of both cards to decide which card is better for me. It happened for a few weeks in April. 5% discount IS applied to GC purchases, except for Visa, MasterCard, Amex or Target. 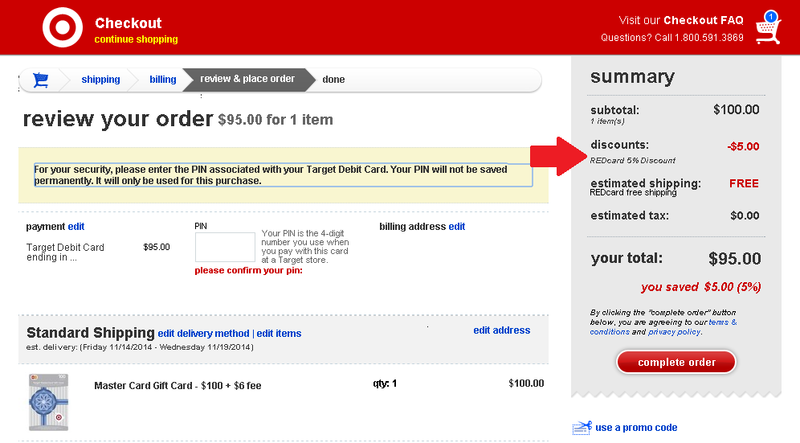 It seems that Target implemented a new rule on gift card purchase. 5% REDcard discount is no longer applied to any GC purchases. 5% discount had been never applied on Target GCs purchases. So, the change doesn’t affect on Target GCs purchases. 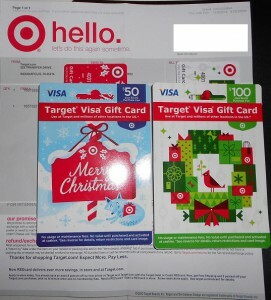 A few weeks ago, Target started selling high denomination of Target Visa gift cards ($200 and $400) online. And 5% discount was applied to these purchases. I believe this deal had been available for a week or two after their debut at Target.com. However, this deal ended last week. The VGCs of other denominations have been available since way before. But 5% discount wasn’t applied on these GCs purchases. 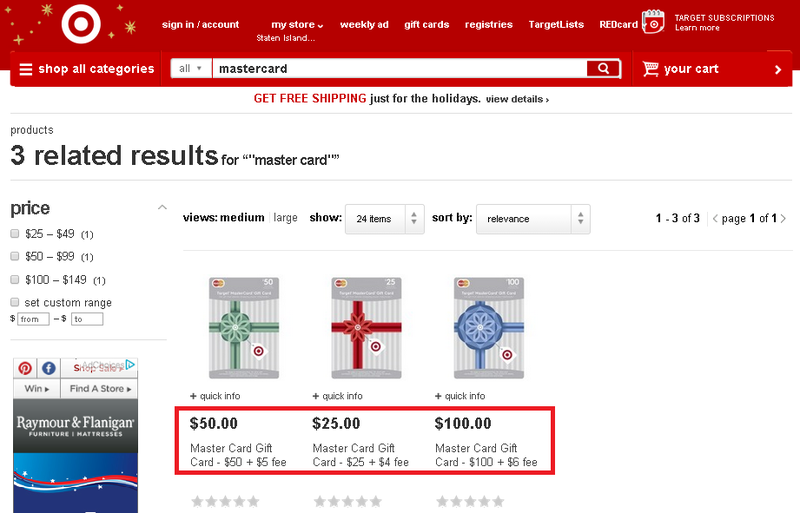 The available denominations of Target MasterCard gift cards are $25, $50, and $100. It had been several months that they sell MCGCs, and 5% discount was applied when you check out with REDcard. This deal have ended at the same time as $200&$400VGCs’ deal ended. The 5% discount had been applied on 3rd party GC purchases for years, but it’s ended as well. Generally, you don’t get cash back on GC purchases. Back then, ShopDiscover ( a former version of Discover Deals) paid cash back on GC purchases except Target GCs. I used to buy a bunch of VGCs through it. After ShopDiscover stopped being a partner with Target, I couldn’t find any cash back portals that pays on GCs purchases until yesterday. I purchased one 3rd party e-GC yesterday. The main purpose of this purchase was to make sure if I can still buy 3rd party GCs with Target GCs, and just in case I clicked a link on one portal site. The order went through successfully. And the portal site sent me an email that told me I earned cash back. I checked my account and saw a pending cash back posted. Soon after, I purchased one $400 VGCs with a regular credit card, via the same portal site, hoping for the same result. I received an email as well. This time, however, it clearly says that the amount of cash back is $0. 5% REDcard discount is no longer applied to ANY GC purchases. You can still use Target GCs for GC purchases except Visa and MasterCard. So, you can still save money on GCs (again, except Visa and MasterCard) by paying with Target GCs which you buy with discount at eBay, cardpools, etc. Cash back deals vary by portals and GCs you purchase. This story is limited to online purchases . I don’t know outcomes for in-store purchases. Updated 05/02/2015 – I noticed that 5% REDcard discount on 3rd party GC purchase is back again. 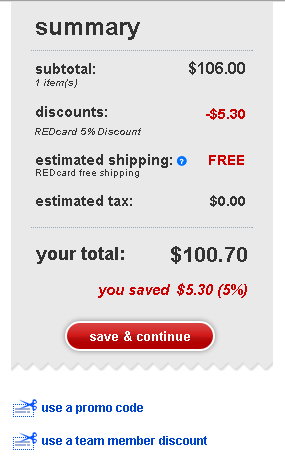 I haven’t actually checked out, but the discount appeared in a cart after I choose REDcard as a payment method. I did that for several 3rd party GCs and confirmed that the discount was applied. Unfortunately, it didn’t applied to Visa, MasterCard, and Target GC purchases. Now, I can load money up to $1500. I took AmEx GC and Visa GC to Target and planned to make two reloads with them. First, I went to the customer service. I told the clerk that I wanted to load $500 to the temp card. She swiped my temp card on a register that is facing to them. Then a PIN pad that is facing to customers says, “Slide your card.” I did it with AmEx GC. After I had signed on a PIN pad, the clerk asked me to hand her the AmEx GC. Then she typed something on the register (probably the last four digits of the card.) Nothing else can check, anyway. There is no name on AmEx GC, and there is no name on the temp card, either. She gave me back both cards with a receipt of reload. My first reload to Redbird was done successfully. It was very smooth. I was worried if they don’t know how to load or refuse to load. Because in the state I live (NY), Redbird hasn’t been available for purchase yet. After that, I bought some groceries with the temp card in the same store. And then I tried to reload at a cash register which I just bought groceries. However, the cashier told me that I had to go to the customer service for reload. I didn’t want to go to the customer service again. So, I left the store without the second reload. This was what I had never expected. I assumed that I could have it loaded at any cash registers as well as the customer service just like at Walmart for Serve reload. I thought back a little while and tried to remember what blog posts and forums said. None of them mentioned about such a thing. So, I guessed that the cashier didn’t know how to reload or that the store instructed cashiers to send customers to the customer service for reload. To make sure of it, I went to the next Target store which was only a mile away. At the next store, I went to the customer service first because I wanted to make sure that I could use Visa GCs for reload. I brought two $200 Visa GCs which I had bought at Best Buy. This time, I asked a store clerk to load $400 and make a payment split into two. The process was the same as the previous one until I swiped the first card (Visa GC.) A display of PIN pad prompted to enter PIN, but the clerk told me to press “Cancel”, which is a red button at the bottom left corner of PIN pad. And then a display (touch screen) showed “Debit” and “Credit.” I was told to press “Credit” and signed. I did the same for the next card. In that store, I made a small purchase with the temp card and then asked to load at the cash register. This time, I successfully had it reloaded. I used one $200 Visa GC and entered PIN (used as debit card.) Here is the receipt (on the left.) As you see, it doesn’t show the balance of GC. 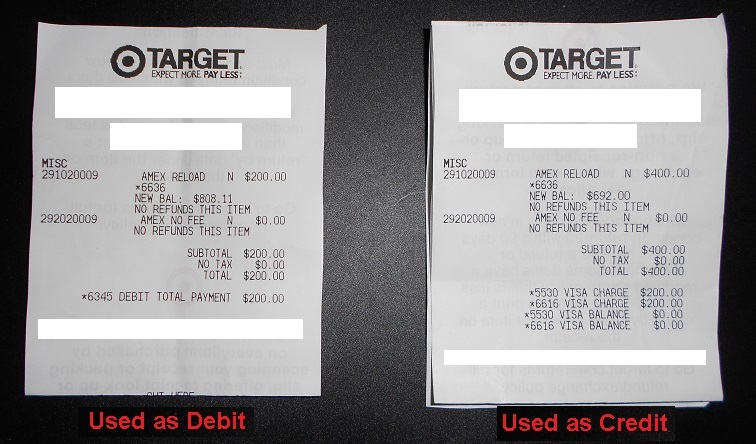 When you use Visa or MasterCard GCs like credit card for reload by split payment, Target’s POS knows the amount of GCs. So, maybe I don’t have to tell the cashier the remaining balance of GCs. I wonder if it automatically drains the remaining balance and up to how many cards Target allows in a single transaction. I will find out later. 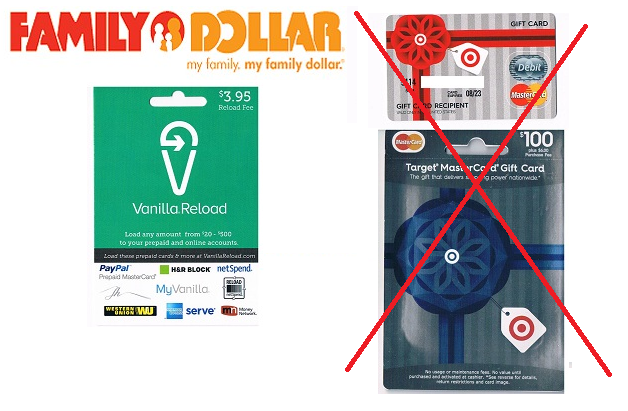 Target MasterCard Gift Card is similar to Vanilla Visa Gift Card, But…. My order at Target.com arrived. It’s Target MasterCard gift card. 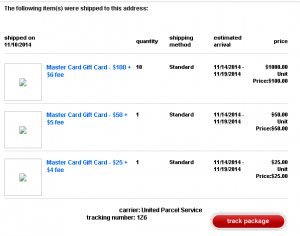 When I placed the order, there were no purchase fee, and somehow REDcard 5% discount was applied (see detail here.) The back of the package says almost the same as one from Target Visa gift card. The only difference is that “pursuant to license by MasterCard International.” instead of “pursuant to a license from Visa U.S.A. Inc.” I can check the balance, reset PIN, and assign ZIP code in the same website, mybalancenow.com. You can do the same things in the websites, vanillavisa.com and onevanilla.com, for Target Visa or MasterCard GCs, and vice verse. It means that all those cards, Vanilla, One Vanilla, Target Visa and MasterCard GCs, have all the same features. So, I thought I could reload American Express Serve with these gift cards at Family Dollar. But, it failed. After I swiped the card and entered PIN, a PIN pad said, “invalid card number.” I tried another card, but it was the same result. Only a week ago, I loaded with Target Visa GCs at Family Dollar. So, unless POS system has changed since them, the problem is it’s MasterCard. Well, now I need to spend all GCs by purchasing. When I visit Walmart, I will try to use the card at Walmart ATM. I don’t think it will accept it, but it is worth a try. The order I placed yesterday has been shipped. 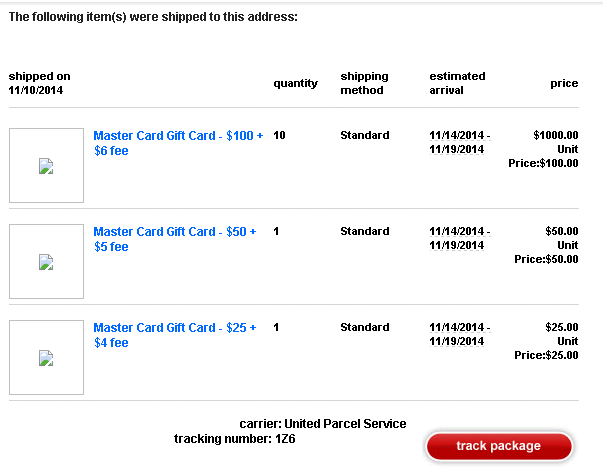 I bought MasterCard Gift Cards online, but Target didn’t charge a purchase fee and applied 5% REDcard discount. I checked the site today. It seems that “No fee” deals has ended, but 5% REDcard discount is still available. A purchase fee of a $100 MasterCard GC is $6, and REDcard discount is $5.30. So, it’s not a good deal unless if you can use other payment methods and still get 5% REDcard discount. First, I changed the payment method into the other credit card. When I did, the page was automatically refreshed, and REDcard discount disappeared. 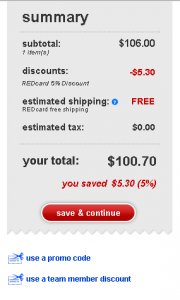 Next, I chose REDcard again to let it reappear 5% discount, and then clicked Target Gift Card. I entered numbers and clicked “save & continue.” 5% REDcard discount was still there. I got Target GCs with around 7% discount. So, if the order goes through, I will get $100 MasterCard GC for around $93! From my experiences, I’m pretty sure that I would be able to place an order and receive a confirmation email. The point is, after that, whether or not Target would cancel the order. However, I decided not to order. If I didn’t order twelve GCs yesterday, I would be excited to perform this experiment. I don’t want any potential problem while twelve GCs are on the way. I will perform the experiment some other time. The Visa gift cards have arrived today. I checked the balance, and they have the correct amount on each card. I ordered the GCs on November 5th. I paid $150 for $100 and $50 Visa GCs. They didn’t charge a purchase fee on that date. That was a perfect opportunity of manufactured spending, but they started charging a fee next day and keep doing so since then. However, I found another new gift card today. It is MasterCard. They have the denomination of $25, $50, and $100. The listing page still shows that $100 MasterCard GC costs $100. When I added it to a shopping cart, there was another surprise. 5% of REDcard discount was applied on this order!!! I don’t care if this is an error. I don’t want to miss this opportunity, but I don’t know about Target MasterCard GCs. Can I load my AmEx Serve with them at Family Dollar? Do they have PIN, anyway? And probably, Target limits on a number of cards you can purchase. So, I purchased moderately. The total of value of GCs is $1075. There is no fee. REDcard discount is $53.75. I spent only $1021.25! I don’t know if this deal (or maybe an error) will last. You’d better check out today. 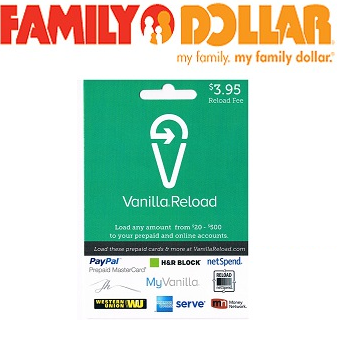 Walmart MoneyCard is reloadable prepaid card that has Visa or MasterCard logo on it. You can use it just like as a debit card. For standard debit cards issued by U.S. major banks, you have to have enough money in your bank accounts to make a purchase with the cards. For reloadable prepaid cards, you need to add money to your card’s account. (It is also like a bank account, but it exists online only.) As its name shows, Walmart MoneyCard has benefits for people who visit Walmart often. You can load the card with Visa or MasterCard gift cards at Walmart ATM. Once money is loaded, you can make a purchase in stores and online anywhere Visa or MasterCard is accepted. Depending on stores, you can get cash back at the register. By using self-checkout cashiers, you don’t have to feel awkward when you get a large amount of cash back with a small purchase. The card does a great job for liquidating Visa/MasterCard GCs. You can pay credit cards’ bills. The single transaction is limited $1000. It is not a lot, but if you have another prepaid card that have a bill-pay feature (for myself, AmEx Serve), pay bills with both cards in turn. Paying large bills and paying too frequently with the same card are red flag, anyway. Using multiple prepaid cards to pay bills helps each payment smaller and interval between payments with the same card longer. There are four versions of Walmart MoneyCard, but I recommend only one “Preferred”. That’s because “Preferred” is the only version that offers $0 reload fee at Walmart ATM. The others charge $3 for every swipe reloads. There is no fee when you load at Walmart ATM, make a purchase in stores, get cash back with purchases and pay bills. 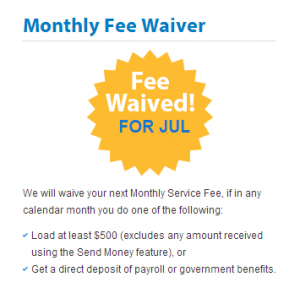 The card costs $4 (one-time payment for a personalized card), and monthly service fee is $3. The monthly service fee is waived if you load $500 or more in a calendar month. You can withdraw money at MoneyPass ATMs with no surcharge, but ATM owner fee would be charged. So, I’ve never withdrawn money at ATMs. Just make a small purchase and get as much cash back as possible. 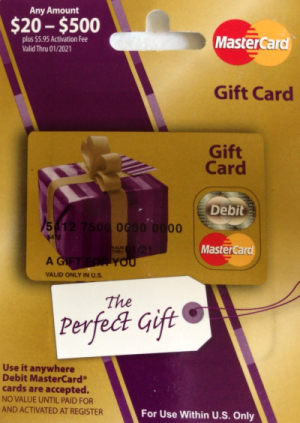 Walmart MoneyCard Preferred is a great tool to liquidate Visa/MasterCard gift cards. There is no fee to load with GCs at Walmart. And the money in the card can be quickly unloaded by getting cash back with a purchase at stores. And paying bills of your credit cards boosts up your manufactured spending. You can choose between Visa and MasterCard when you apply the card. You can also add a favorite photo to your personalized card for free. Except for a Target Visa GC, the others were successful to reload Serve. I tried twice and also tried to reload another card (Walmart MoneyCard Preferred) with Target Visa GC, but all attempts failed. ATM seemed to recognize the card as a debit card and even prompted me to enter PIN. But, they declined the transaction in the end. At first, I thought it was a temporary problem. It did happen to me before. A Visa GC had declined one day, but the same GC accepted on the other day. However, after I went home and searched about this on the internet, and I saw the websites here and there. It seems Walmart started being picky on types of debit card for reloading BlueBird/Serve/Walmart MoneyCard. According to the websites, Vanilla Visa GC and OneVanilla Visa GC are no longer accepted at Walmart ATM. Both GCs are issued by Bankcorp, which also issues Target Visa GCs. Many people experienced the same problem, so probably, these GCs are no longer available for Walmart Swipe Reload. When I go to Walmart next time, I will give it another try.